This is not so much a question as it is information I thought would be useful for people who are photographing dragonflies and damselflies. With 826 species of damselflies and 1069 species of dragonflies, it is important to have a comprehensive resource for identification. Dr. John Abbott's Odonata Central is one such source. The Field Guide is set up by scientific name with the common name folloowing. You can click on a species and you will go to a page with a photo and a description which includes information on specific identifying characteristics to look for. In addition, each species has a photo gallery. I find that photo gallery especially useful because it shows both male and female forms and different angles which allows me something very visible and concrete to compare my photo against. You can also get information as to seasonality and where in Texas it has been found. 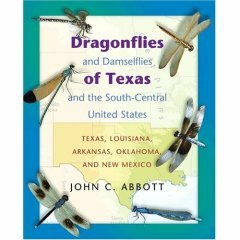 Dr. Abbott's book Dragonflies and Damselflies of Texas and the South Central United States is a great reference. I use it to make my initial guess and then I go to the website to view the photo gallery for the species. The book is arranged by the scientific organization. Hopefully eventually I will get more familiar with each type of damsel and dragonfly. While geared toward the south central United States, I think this would be a great reference for other people.